There are few things more frustrating for a parent than to have a child who is a picky eater. While one child will enjoy eating anything that the family is dining on, other children may willfully limit themselves to eating just a handful of particular foods or take forever to swallow a tiny morsel that they have been chewing on for the past 10 minutes. 1. Do Not Make Your Child a Separate or Special Meal: Your child should eat whatever the rest of the family is eating. They may not eat everything that is on the plate but even a few bites will keep them from being hungry. Making a special meal for the finicky eater encourages the behavior to continue, not to mention creates extra work for you. 2. Disguise Foods: If your child refuses vegetables, find creative ways to put vegetables into their meals. For example, if you’re making meatloaf, you can mash up peas and carrots into the chopped meat and your child will most likely not even realize that it’s in the meal. 3. Condiments Can Help: If your kid gives you a hard time with chicken, pork or fish, don’t hesitate to offer a side of mustard, ketchup or tartar sauce to spice up the meal. Create a dip to make vegetables more fun if you have to, like ranch dressing. If your child likes dips and dressings try adding gravy or mayo to the side of their meal-whatever it takes to make a boring meal exciting and taste good! 4. Mirror Foods they Love: If your child likes a particular food, then give them similar foods to dine on. If chicken nuggets are a favorite, add sides such as grapes, yogurt or carrots to bring in a healthier variety. If pizza is a meal your child desires, instead of cheese try variations with chicken or a veggie topping. If your child favors certain textures, stick with foods that are in the same texture family. 5. Reward Good Eating: Offer to give a dessert, but only if your child has finished their meal or has tried a new food. You might tell them that you will get them a small prize if they eat a new vegetable or fruit every day for a whole week, etc. Be consistent when introducing new foods. Figure out what works for your child in terms of a reward, and use it effectively to help them reach a food goal. 6. Let Them Cook: An effective way to get your child involved in the meal is allowing them to participate in making the meal. Work together to pick an easy recipe, cook the meal and serve it to the family. Your child will be so proud of their accomplishment; they won’t hesitate to gobble up their masterpiece. 7. Choices: Try giving your child a choice between two foods. “Would you like chicken nuggets or a ham and cheese roll?” is a perfectly reasonable question and helps your child feel like they have control of what they eat for a meal. 8. Avoid Snacks: Limit or stop snacking for a picky eater. The hungrier they are, the more likely they are to eat what is on their plate at meal time. 9. Don’t Yell: Don’t use punishment or yell to get your child to eat—it creates a stressful meal time for the entire family. If they tried a bite of something new or finished an acceptable portion of their meal, praise them for it. If your child refuses to eat something, then simply take the plate away when the family is done eating letting your child know that when they are hungry their plate will be reheated. If your pediatrician feels that your child is healthy despite the picky eating habits, your child will be fine. Don’t worry about sending your child to bed hungry and don’t feel like you have to force feed them either. 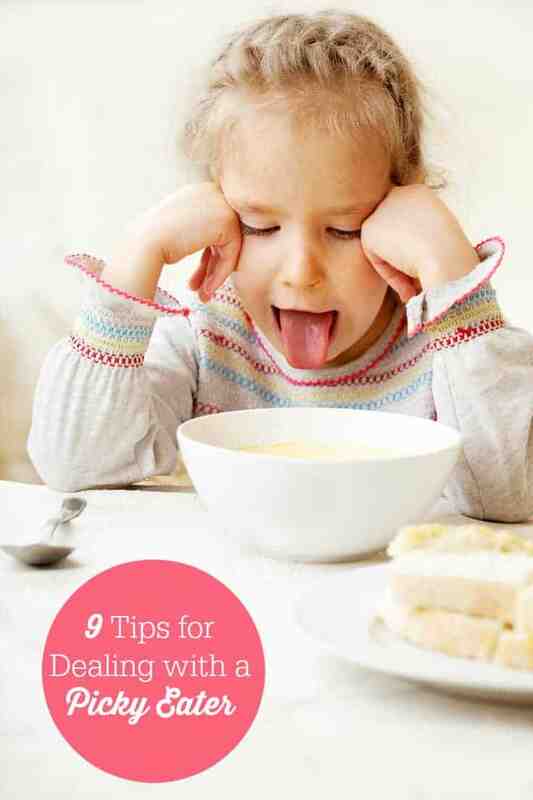 Eventually, as kids get older, most of them outgrow their finicky eating habits. By Robin Greene, a mom of two and a kindergarten teacher. Robin is also a freelance writer for My Baby Clothes dot com and enjoys giving helpful tips to parents. I know several parents that have this problem with their kid. It can be really frustrating. I like this tips very much, I am quite sure they can help a lot. Thanks for this post.